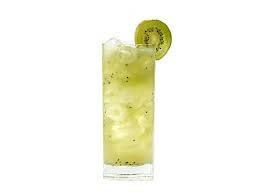 The Kiwi Refresher is simply an awesome Cocktail. Using very few ingredients, this gentle giant of a Cocktail packs a punch full of zest, taste and flavour. The Kiwi puree has more flavour and essence than using the real fruit - which can be delicate and be obscured by other ingredients. The Soda water adds sparkle and depth to this wonderous Cocktail. Fill Cocktail Shaker or Boston Can with ice. Add ingredients. Stir. Strain to chilled Hi-Ball Cocktail Glass.